A couple of years ago I was on a roll. I was in one of those cooking moments when everything you touched turned to edible gold, and your family marvels at how you once again pulled off a delectable wonder. And while I knew that phase would not and could not last for practical reasons like, we were leaving Northern California and the wonderful farmers markets I frequented to buy my ingredients and receive inspiration. As well as impractical reasons like it’s Friday and I’m not cooking. So in preparation for the end, I began to photograph in the best light the meals, desserts and snacks I prepared. My husband thought I wanted to start my own Smitten Kitchen, but I figured there can only be one Deb, plus I was more so photographing with my novice camera as a way of remembering what I made, in case I went through that inevitable dry spell. And sure enough it came and went, and then came again. Only this time I had made the mistake of not backing up my hard drive for oh-say a year and among the precious treasures that I lost like first birthday parties and one of a kind pics with great-grandpa, I lost all those fabulous food images. So bear with me as I may post an occasional recipe in homage to those that didn’t make it. 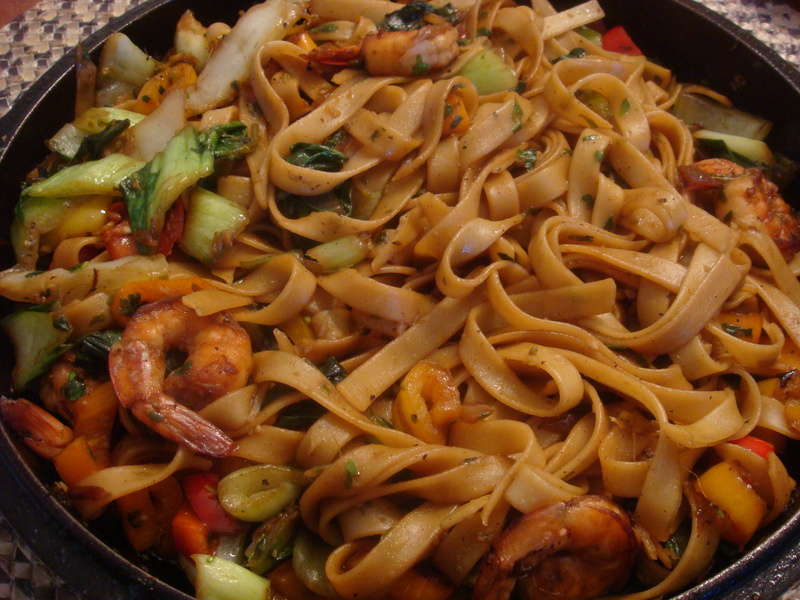 This Not-So Drunken Noodle recipe is my go-to middle of the afternoon, need a hot lunch kind of meal. It can also serve as a great dinner when paired with a spinach salad. 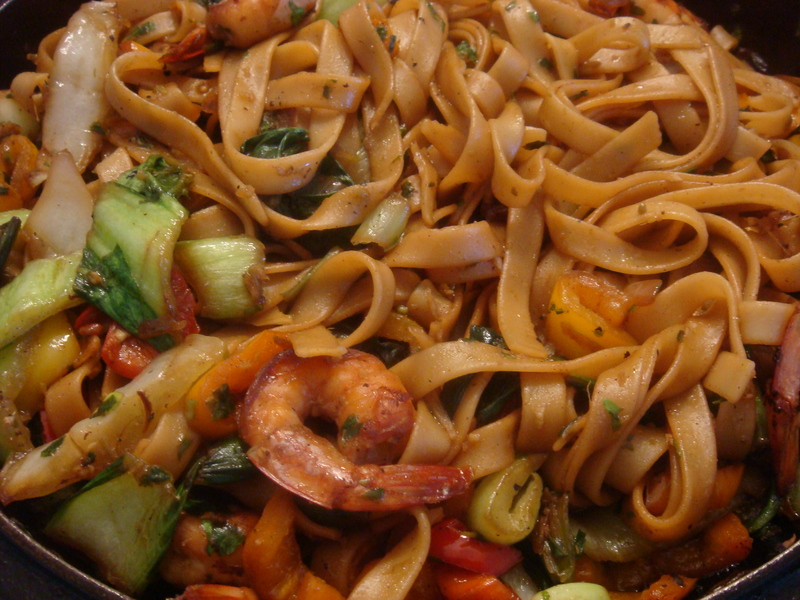 You may notice that it is quite different from the real Thai Drunken Noodle recipes available as they are made with Thai basil and rice noodles. I make this version using whatever I have on hand that can closely resemble the real thing like Italian basil and fettuccine. Nonetheless, we enjoy it and I hope you will too. Prepare noodles ahead of time according to the package directions, this can even be done the night before. I like the texture of day-old noodles. Noodles should be cooked, but not too soft as they will cook again in the pan. Mix together the tamari, fish sauce, water, mirin and brown sugar in a bowl. Add the thawed shrimp to the sauce and toss just until each piece has been coated in sauce. Heat a wok or in my case a large cast iron skillet over med heat, adding 1tbs of the sunflower oil. Add the shrimp and cook stirring, for 5 minutes. Remove the shrimp from the pan and set aside on a plate. Scrape the skillet clean. Add the remaining oil and cook the onions, shallots and peppers, stirring until softened about 5 min. Then add the bok choy and cook together for another 3 min. Adjust heat as needed. Add the shrimp along with the minced garlic and ginger, stirring frequently. Add the cooked noodles and stir for another minute. While stirring add the sauce and cook just until everything is covered in the sauce. Add the fresh basil leaves and optional chili pepper and serve. You are currently reading Not So Drunken Noodle at The Prude Papers.